Just wanted to post an update on The Lake Erie Monster #1 retailers situation. The issue’s been selling out all over the place! Carol & John’s Comics sold out last week, and re-upped for 20 more copies, so they should have it. Comics Are Go! in Sheffield Village out by Lorain County Community College sold out of their initial copies and have been restocked. Above you will see The Lake Erie Monster #1 sharing shelf space with some of our favorite comics, creators, and publishers. A) B.P.R.D. Hell on Earth: The Long Death #3 by Mike Mignola, John Acrudi, and James Harren, published by Dark Horse. This comic, and the entire Hellboy/BPRD line, is nothing short of amazing. In this issue a Wendigo fights a Were-Jaguar for like, 16 of 22 pages. B) Reset #1 by Peter Bagge, also published by Dark Horse. Have not read this yet, but Bagge’s comics are a constant source of hilarity and despair. C) Ragemoor #2 by Jan Strnad the legendary horror comic artist Richard Corben. Again, haven’t read this yet, but Corben is a monumental inspiration. D) Cleveland by Harvey Pekar and Joseph Remnant, published by Top Shelf. This is a really beautiful book, and an incredible epilogue to an exceptionally long career of telling stories about a particular place. The Lake Erie Monster is very much indebted to Harvey Pekar for his contribution to both the comics medium and the city we love and call home. E) Rachel Rising #7 by independent comics legend Terry Moore, who has been creating and publishing his own comics for as long as we can remember. Doing his own thing, going his own way, and crushing it the entire time. F) The Shadow #1 by Garth Ennis and Aaron Campbell, published by Dynamite. While we can’t vouch for this particular comic book, it is interesting to note that The Shadow, one of the OG pulp characters from way back when, keeps coming back for more. It came from an era of disposable culture, and has outlasted most of everything since. In the distant future there will probably be brain-cast holo-comix about The Shadow. G) The Sixth Gun #21 by Cullen Bunn and Brian Hurt, published by Oni Press. Now, this comic, we can vouch for! The Sixth Gun is an awesome horror/western/action comic about supernatural weaponry and the desperadoes who love them. Really great comics! H) The Walking Dead #96 by Robert Kirkman, Charlie Adlard and Cliff Rathburn, published by Image Comics. Again, having not read this, it’s of note as maybe the most obvious “Best Case Scenario” for an independently published comic book. I) Dark Horse Presents #11 by Various, published by Dark Horse. Dark Horse Presents has a long history as the best of comics anthologies going back to the late 80s. This current incarnation has been pretty great, overall. Some stories are hit or miss, but every issue has at least a couple that really stand out. Issue #4 has an amazing piece by friend of Shiner Comics, Dara Naraghi. Issue #7 has a really well done, stand-out piece by another friend of Shiner Comics, Brandon Graham. 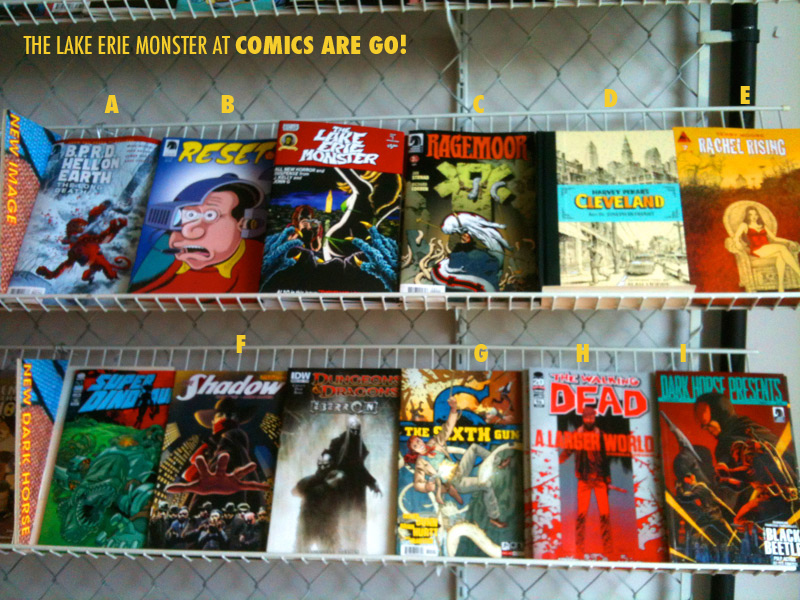 There you have it, that’s what The Lake Erie Monster is sharing shelf space with down at Comics Are Go! It’s an honor for us, and we’re stoked to be in such great company. We would also like to thank all of our great retailers, and everyone who’s bought the comic. We’re eternally grateful for all the support. We’re hard at work on issue 2, so mark late June on the calendar. Things are going to be heating up! If you haven’t gotten a copy yet, and would like one, the best way to find out where they are sold, or to buy one directly from us, is to click on the “Buy The Comic” page at the top of this blog. Thanks Again!